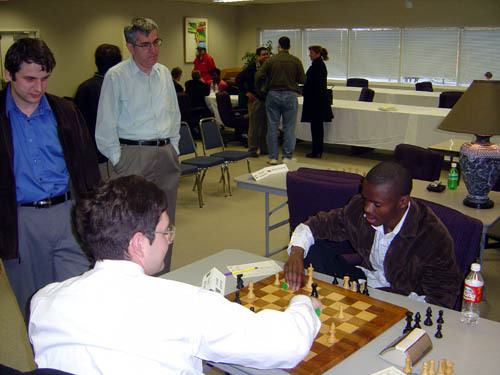 Amon Simutowe finished the University of Texas-Dallas GM tournament yesterday with a respectable 5-4 score. A Category 10 field, he held equal with the four Grandmasters and handed co-winner Yury Shulman his only loss while losing to Igor Novikov, the other co-winner. He told The Chess Drum that he was pleased with his overall level of play, but most important was the energy in which the games were played. Simutowe noted that each player had brought a level of danger to the board which made the tournament that much more exciting. This tournament was the strongest ever held at the collegiate level and has been kept out of the public eye to avoid revealing secrets for the upcoming Pan-Am Intercollegiate tournament which will be held in Wichita, Kansas. Simutowe expressed heightened anticipation for his next international tournament. IM Amon Simutowe and GM Alexander Moiseenko analyze their exciting draw from the last round of the UTD International. Others in the picture are UTD graduate & former chess team captain GM Yury Shulman, and UTD chess coach IM Rade Milavanovic. Photo by Rodney Thomas.